Union Minister for Chemicals & Fertilizers and Parliamentary Affairs, Shri Ananthkumar presided over a Joint review meeting on revival plans for closed fertilizer projects under Ministry of Chemicals and Fertilizers here today. 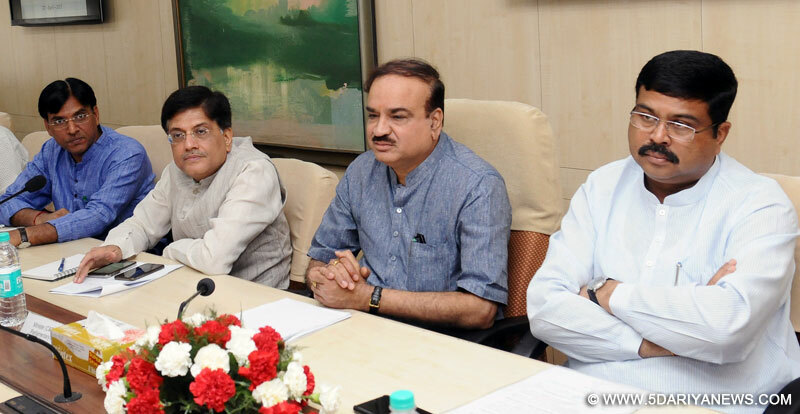 The review was jointly held with Minister of State (IC) for Power, Coal, New & Renewable Energy and Mines, Shri Piyush Goyal, Minister of State (IC) for Petroleum and Natural Gas, Shri Dharmendra Pradhan and Minister of State for Road Transport & Highways, Shipping, Chemical & Fertilizer, Shri Mansukh Lal Mandaviya. Senior officers from the three Ministries were present during the meeting.Addressing the media after the meeting, Shri Ananthkumar informed that with the revival of the fertilizer projects, Gorakhpur, Barauni, Sindri and Talcher, an additional annual production capacity of 75 LMT would be created making India self-reliant in meeting the annual domestic demand of around 320 LMT, from being a net importer currently. Financial allocations and the ground level work would start in 2017 and the five plants would become fully functional by 2020-21, he added. Shri Kumar said that for realising Prime Minister Shri Narendra Modi’s vision of ‘Fertilizer Security for Food Security’, the Ministry of Chemicals & Fertilizers, in coordination with Ministries of Petroleum & Natural Gas and Power & Coal, is following a two-pronged strategy. This strategy includes existing fertilizer capacity augmentation by increasing the efficiency of the plants and revival of closed fertilizer projects. Shri Kumar mentioned that there has been highest ever production of urea, 245 LMT, in the country in the previous year without incurring any additional cost and utilising the existing capacity. He further mentioned that the 100% Neem Coating Urea has increased the per granule efficiency of urea by decreasing demand by 10% and increasing the yield by 10%. Informing the media about the role of the Ministry of Petroleum & Natural Gas in the revival plan, Shri Dharmendra Pradhan said that a massive investment to the tune of Rs. 50,000 crores is being undertaken for revival of closed fertilizer plants and setting up of gas pipeline network to connect Eastern India to the National Gas Grid. Production from these four major Fertilizer plants will ensure enhanced domestic fertilizer production and availability which will give an impetus to the vital agricultural sector there by aiding the Second Green Revolution, he added.Shri Pradhan informed that the progress of the construction of the pipeline network in eastern India, including the 2,650 km Jagdishpur-Haldia & Bokaro-Dhamra Natural Gas Pipeline, popularly known as ‘Pradhan Mantri Urja Ganga’, and the 50 LMT Dhamra LNG terminal was reviewed in the meeting. A total investment of Rs. 13,000 crores for the pipeline and of Rs 6,000 crores for Dhamra LNG terminal is going to be undertaken, he added.The Minister said that this pipeline network would provide uninterrupted feedstock linkage to the revived fertilizer plants, wherein Gorakhpur, Barauni and Sindri plants would be natural gas based and Talcher would be coal gasification technology based, for which coal linkages have already been provided. Shri Pradhan added that the foundation stones for the five fertilizer plants would be laid down post monsoon this year and would be completed by 2020-21.The Talcher Unit is being revived by a consortium of PSUs namely Rashtriya Chemicals & Fertilizers (RCF), Gas Authority of India (GAIL), Coal India Ltd. (CIL) and FCIL by investing Rs. 8,000 crores. Indian Oil Corporation Ltd. (IOCL), CIL & National Thermal Power Corporation (NTPC) have registered a Special Purpose Vehicle (SPV) by name Hindustan Urvarak & Rasayan Limited (HURL) for revival of closed urea plants of FCIL at Gorakhpur and Sindri and of Hindustan Fertilizer Corporation of India Ltd. (HFCL) at Barauni, by an investment of Rs. 20,000 crores. An Inter-Ministerial Committee (IMC) has also been constituted to oversee the revival process.